Planes, trains and automobiles can be challenging environments for little ones. So when the books, plastic action figures and other assorted toys fail to entertain my 2 ½-year-old son, I’m ready with an iPod Touch loaded with Blues Clues and a pair of kid-friendly headphones. The kid-friendly bit is essential. According to a U.S. government survey, 12.5% of children ages 6 to 19 (approximately 5.2 million children) have permanent damage caused by exposure to loud noises. Noise-induced hearing loss occurs when kids have been exposed briefly to a very loud noise or over time to noisy environments. Most MP3 players max out at about 103 decibels (dB), though some can reach sound levels of up to 120dB, which is like standing 100 feet behind the engine of a jet plane as it's taking off. According to the National Institute on Deafness and Other Communication Disorders (NIDCD), more than a minute of exposure to 110 dB (ex. a chain saw) risks permanent hearing loss, as can 15 minutes at 100dB or prolonged exposure at or above 85dB. 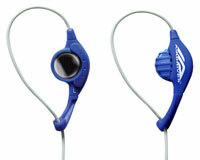 For my 2 ½-year-old, I like the Kidz Gear Wired Headphones ($20). These traditional-style headphones have a built-in volume control, are fit him comfortably and deliver good sound. There’s also a wireless version ($35) that works with infrared-based car entertainment systems. Since he can easily turn the volume all the way up on the headphones, I also make use of my iPod Touch’s “volume limit feature (found under settings) to set the maximum volume. About 75 percent is the maximum recommended limit. My 6-year-old son is very active and tends to walk around our home with his game system, so I want to make sure he’s aware of his environment. So the perfect choice for him is the Mad Catz Airdrives Fit Interactive for Kids ($15), which is rated at a maximum of 80dB at the inner ear. The speaker sits outside the ear canal, so he can hear what’s going on around him, and is held in place with a wire that loops over the ear and cinched for a perfect fit. Since my 9-year-old daughter likes to retreat to her room with a movie or her music, I chose an in-ear style for her, the Logitech Ultimate Ears Loud Enough Volume Limiting Earphones ($19). The earphone physically blocks ambient sound, so she’s not tempted to crank the volume. Plus, the earphones themselves knock 20dB off any sound source. 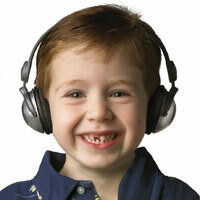 To test your child’s headphones and MP3 player, try them on and crank the player to full volume. If you can’t hear someone talking to you in the same room, the player is too loud. The National Institutes of Health also suggests taking periodic 15 to 20 minute breaks when listening at high volume to let the inner ear recover. Frankly it’s good advice for all of us.